In recent years, sourcing and supply management has emerged as one of the greatest opportunity areas for retail business as well as for suppliers to leading retailers. At the same time, it is possibly also the one most prone to risk. This set of activities holds the key to improving service, product offer and overall profitability, and yet also provides some of the most difficult challenges of doing business globally. Certainly, you need to have winning products. Of course, you need to pick the best supply countries to source from and the best suppliers. Certainly negotiation and cost management are an important part. But the only way to achieve these many “bests” is by ensuring that sourcing is well and truly integrated within your overall business strategy, and that sourcing activities closely follow the direction set by overall business strategy. Let us cast a quick glance over the major changes taking place in the textile and apparel trade globally. The of the most important questions in sourcing are “From where/whom?” and “How?”. They also provide most of the unpredictability and the risk that so characterises sourcing. For this heavily protected trade, one of the most important developments is the transition from the General Agreement on Tariffs and Trade (GATT) to the World Trade Organisation (WTO). Put simply, the WTO is driving towards increasing mutual market access for producers in countries that are a part of the WTO. The major aim is to remove quantitative restrictions, including quotas, and to reduce import duties, which act as a barrier to cross-border trade. 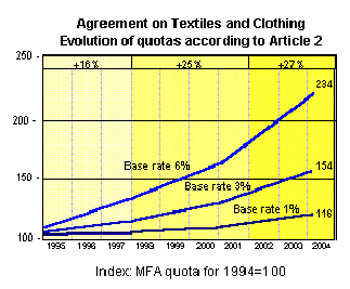 If all goes as planned, 1 January 2005 will see a textile and clothing world trade free from quota restrictions. That one element, which possibly guides apparel and textile sourcing more than anything else, will cease to exist. However, to minimise the “cliff effect”, quotas are being phased out in four stages, rather than abolished at one stroke. So, the WTO agreement should lead to greater supply and lower prices due to lower import duties and no quota premium, and make our lives simpler overall. However, while quotas are still in place, some countries that are relatively smaller exporters of apparel (such as India, Pakistan, Turkey, Indonesia etc.) are being allowed to grow their quotas faster than larger exporting countries (such as South Korea, Taiwan, Hong Kong and China). Also, regional trade agreements are allowing countries close to the major developed markets to export apparel and textile products free of duty and quota already – such agreements include NAFTA (USA, Canada and Mexico) and the European Union’s agreements with former Communist countries, as well as Turkey and North African countries. Annual growth rates of such regional trade are over 20%, compared to the 2-5% growth rate of imports from Asia into the EU and the USA. Due to these factors, many more cost effective supply bases are developing quickly, adding to the complexity of choice. Many of these are low cost supply countries that now exist not only in Asia, but in Europe and the Americas as well. So which countries should you pick? Is Hungary better than the Hong Kong, the Caribbean better than Cambodia? Should you still be sourcing from the high-cost countries such as Italy, the UK etc. when there are so many low cost bases from which to choose? Full capability suppliers, who are handed a product concept by a retailer, and take complete responsibility to develop, produce and deliver the product. Brand manufacturers, who create the product concept, own the brand and the factories, and who supply into a part of the retailer’s product range. Some of these methods are declining, some are increasing in popularity, while others are stable. Should you apply more than one? Should you differentiate depending on the supply country or should you adopt one as “the way” for your business? The problem, clearly, lies in the unpredictability about the benefits from each country and method of sourcing. And, simplistically, the solution lies in taking as much of the uncertainty out. The way to do that successfully is to ensure that your sourcing strategy, organisation and processes are led by your overall business strategy. Many organisations, retailers as well as suppliers, have built up highly successful businesses in the last few years by ensuring that sourcing is one of the core management areas of their business rather than an afterthought. But in many more, sourcing is relegated to the “back-room”, as something that happens mostly outside the company’s boundaries. How can you bring sourcing within the mainstream of your business? Imagine the sourcing process. Some people might imagine conceiving a product, a style, putting together the fabric and trims, creating a sample, getting it produced within a given time and cost. Others would visualise it beginning with next season’s business plan, a plan to sell certain numbers of a product at a particular price, bought in at a certain cost with a planned profit and mark-down allowance. Still others might remember exchanging endless overseas telephone calls and faxes with their suppliers, the dreaded messages from the shipping company about late deliveries. All of those unpredictables that make sourcing a gamble. Stop! If you are a retailer, I would ask you to now visualise your retail store, your catalogue, your website. If you are a manufacturer, I would ask you to visualise your customer and their consumers. That is where the sourcing process truly begins. Your business is defined by your consumer or customer, who has certain expectations – a product, a particular price, a time limit, a certain quality. Naturally these demands and expectations are what you are trying best to understand and fulfil. So should your associates who support the process. No matter what you are, a retailer or a manufacturer, you need to focus on the consumer. The “push” system of supply is outdated – customers have greater, easier access to a much wider choice of goods and services, and expect ever-greater standards of quality, service and customisation. The sourcing and supply process must change too. Previously one end of the supply chain understood consumer demand, and translated that understanding into a product concept that was manufactured, shipped and sold to the consumer through retail stores. 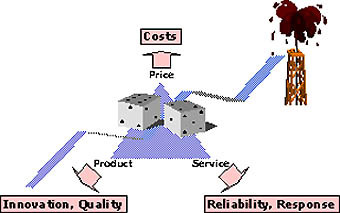 Increasingly now, the functions of Design, Development (production), Distribution and Display (retail) must link together to share skills, knowledge and capabilities that allow joint market analysis, product development, common measurement and accurate forecasting, and create a delighted rather than merely “satisfied” customer. Too often sourcing decisions are made as a reaction to the immediate present and the recent past. Factors such as past relationships, past experience of individual buyers, gut feel and immediate price comparisons are commonly the driving forces. These are all internally focussed; the decisions based on what is available within the business (and its supply base), rather than what the consumer or customer wants. Let us take business strategy first. Generally, three major areas define and differentiate one business from another: Product, Price and Service. A study by global management consultants, Kurt Salmon Associates in 1998-99, showed that successful businesses had a clear positioning in being focussed on a single or a combination of two aspects. On the other hand, business that were not successful financially, were generally fuzzy in their positioning, in their definition of what the business stood for. Are you clear about where your business stands and what is your platform, on which you sell to your customers? If you are, you have taken the first step to sourcing successfully. What are the obvious links with sourcing? If you are price-oriented, surely your sourcing must be driven very much by sourcing cost. But not the FOB cost alone – you need to factor in import duties, transport costs, costs of rejections, costs of maintaining a supplier relationship, and many other factors that are often invisible. If, on the other hand, you are oriented towards Product and Service, surely you need infrastructure within your business or in your supply base to create innovative products, turn sampling around quickly, and ensuring that quality, accuracy and timeliness are the benchmarks used to measure success or failure. So you now understand what your business is all about, and what your sourcing needs to be. Let us ask a third question, do your buyers, merchandisers, technologists, suppliers and logistics providers have the same understanding as you about the defining factors and the objectives? Unless you draw these links, and make sure that everyone around the business shares a common understanding, you will have to resign yourself to live with unpredictability. A final point: there is a wide variety of suppliers and supply bases out there. While defining your business, you also should clearly define how much capability exists within your business to handle the sourcing process from concept to delivery. Define your competencies: can you conceive the product, can you design it, prototype it, define technical specifications, produce (or manage the production) and ship it? What are the things you absolutely wish to control, and what are the activities that you want your suppliers to carry out? Once you have done that, choices become simpler. The future direction for selecting supply countries becomes clearer and identifying the winning suppliers becomes a more rational process. Yogi Berra is quoted as saying, “It’s tough to make predictions, especially about the future.” Certainly, sourcing is a lot about getting your predictions right – the right product, the right quantities and the right timing, the right supply base for future growth. But it helps to make sure that sourcing activity is led as much as possible by targets and business objectives, rather than only by short-term reactions to changes in the environment. Define your business and the business requirements, and let those define your sourcing – that’s the only way to get some of the unpredictability out of sourcing.